Wheel tractor(farm wheel tractor) is drawing on the basis of foreign advanced technology , according to market demand four-wheel drive wheeled tractors with the international advanced level of self-developed. 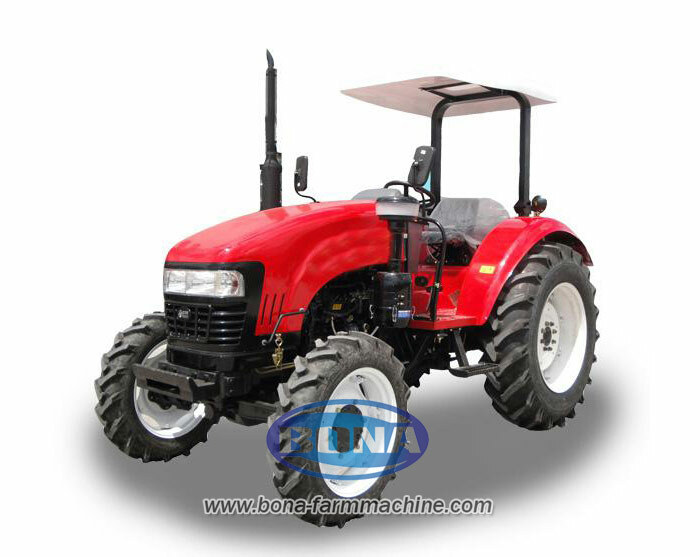 Bona- tractor manufacturer produce the tractor China has its powerful , high performance , attractive appearance , vision , adaptability, widely used in various agricultural operations and transport and other operations. 1 ) Engine power , low fuel consumption , power and good economy . 2 ) Transmission gear and more, wide speed range , easy operation, high efficiency, and the use of chassis cooling system to meet the needs of large- load operation . 3 ) A closed cab, perfect shape , vision, driving comfort . Optional air conditioning, heater , CD player , etc. 4 ) The use of lock-pin differential lock , reliable , easy to operate. 5 ) Hydraulic steering , hydraulic brake system , light and flexible , reduce pilot work intensity. 7 ) Independent PTO meet Rotary , harvesting, planting, fertilizing and milling operations such needs ; synchronous power output to meet the specific operational requirements. 8 ) Hydraulic lift system for the oil structure , the use of more reliable. Enhance the force with force adjustment , position adjustment , a variety of tillage depth control power bit floating comprehensive regulation and control , supporting a large and duplex farm machinery operations ; also optional Forced buried . 9 ) Hydraulic system oil return filter, a small system contamination . 10 ) Import clutch and heavy duty gearbox, higher reliability.